Shop burglar Christopher Clarke let his mask slip – and found himself slapped with a nine-year prison sentence. Now he has been jailed for nine years and four months for his break-in at the One Stop shop in Mill Road, Waterlooville, on October 26. His accomplice remains at large, though. The 34-year-old career criminal, described as a ‘dangerous offender’ by judge Roger Hetherington who was sentencing him at Portsmouth Crown Court last Friday, targeted the shop in a planned attack. 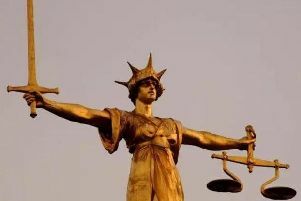 Havant drug addict Clarke, who served four years in prison as recently as 2012 for burglary, went armed to the store when it was dark with his partner in crime just after 9pm. Wearing hoodies and masks to disguise their identities, the pair slickly went about their business of raiding the shop – which had been prey to similar attacks in recent months – while staff were out the back. ‘You went into the shop with implements to force open the till. There was a knife or sword or chisel that was used,’ judge Hetherington said. ‘The other assailant jumped over the counter and violently attacked the till while you took from under your clothing a pole to assist him in extricating the money. Clarke, of Swarraton Road, was only able to enjoy the fruits of his labour for a day, though, after he was arrested by police. It was not known how much cash was stolen in the heist. Previous ambushes on the same store had resulted in increased security with alarms and CCTV – which, along with Clarke’s own carelessness, led to his demise as he was recognised on camera. ‘You were wearing a hoodie and a face mask to cover your face, however your mask slipped down more than you would have liked,’ judge Hetherington said. Clarke was branded a ‘serious risk to society’ with his ‘pro-criminal attitudes’ and disregard for authority. He admitted one charge of aggravated burglary. Following the sentence, Det Insp Luke Aslam, said: ‘This result is testament to the courage shown by the witnesses who came forward and the dedication and hard work carried out by our officers and staff. ‘The role of our scientific services department and crime scene investigators was crucial in this case. The DNA match on the till led straight back to Clarke and gave him little choice but to admit his offences and plead guilty. LONG-STANDING residents in the neighbourhood have expressed their horror at what happened – but have registered their satisfaction that Christopher Clarke has been jailed for a lengthy term. Karen Twiner, 69, said: ‘It’s very scary what happened especially when you think about the people in the shop who were there. It was frightening and wrong what they did.